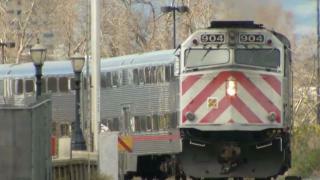 A Caltrain struck and killed a woman trespassing on the tracks Wednesday night in Mountain View, according to the agency. The incident occurred at about 8:15 p.m. on the northbound tracks at the Rengstorff Avenue crossing, a Caltrain spokesman said. Emergency personnel were on the scene, and trains were initially stopped in both directions. Later Wednesday night, passengers on train 193 were transferred to another northbound train. Trains were single-tracking through the area, and delays were as long as 90 minutes, the agency said. There were about 300 passengers onboard the train. No other injuries were reported. The incident is under investigation, Caltrain said. The fatality is Caltrain's first of 2018.